Could this be the greatest Indie achievement of all time? 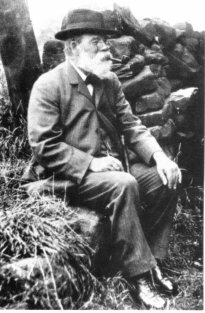 Dr Joseph Wright, born at Thackley, near Bradford, on October 31st 1855, was known in his time as the outstanding authority on dialect. Realising that dialects were fast disappearing, he created The English Dialect Dictionary which ran to six immense volumes. Publishers, however, shied away from it and Joseph decided to self-publish from his Oxford home and achieved instant success. The volumes contained over 5,000 pages, recorded approximately 100,000 words and some 500,000 quotations. The total cost of production was estimated at £25,000. He was already respected as one of the greatest philologists of his time and occupied the Corpus Christi Chair at Oxford, but when he died on February 27th, 1930, it was for his dictionary he wanted to be remembered. Joseph’s life was remarkable in many ways. This brilliant scholar began his life in the workhouse. His father, Dufton Wright, was the son of a wealthy farmer, but Dufton was a ne’er-do-well who worked as a wool-weaver, then as a quarryman, and upped and left his wife and children to the care of the parish. At the age of six, Joseph was working as a donkey-boy. At the age of seven, he was a bobbin-doffer at the Soltaire Mills of Sir Titus Salt. For the first fourteen years of his life, Joseph lived in a one-room hovel with his mother and siblings – when not in the workhouse. He had no education until the age of ten, when he went to the Saltaire factory school for half-timers. There, he learned the alphabet, some arithmetic, and part of the scriptures. When his time as a half-time student ended, he began to educate himself and at the age of eighteen he set up an evening school in his mother’s cottage while working by day at the mills. In 1876, he spent the money he had saved to travel to Germany where he studied for eleven weeks, and returned to Bradford as a junior teacher. In 1878, he matriculated from London University. How did I discover the rags-to-riches story of Dr Joseph Wright? I bought a couple of antique books entitled The Dictionary of Obsolete and Provincial English, in two volumes, published 1904, compiled by a Thomas Wright. Within the age-spotted pages, many of which were still uncut, I found a newspaper cutting, dated 29th October 1955, which was written to coincide with the centenary weekend being celebrated 100 years after Dr Joseph Wright’s birth. The dictionaries I have are chock full of all manner of weird and wonderful words and phrases no longer in usage, or words of which the meanings have radically changed over time. The delightful phrase, ALAS-A-DAY, was an exclamation of pity. I recall AJAX being a toilet cleaner some years ago but its association goes back a long way. Sir John Harrington, 1596, published a celebrated tract called “The Metamorphosis of Ajax” which referred to his invention which was the improvement of the ‘jakes’ or privy into a ‘water-closet’. The book was considered an offence to delicacy for which Queen Elizabeth kept him for some time in disgrace. ABRODIETICALL, adj. described “A daintie feeder or delicate person (taken from Minsheu’s Guide of Tongues, 1627). AFTERMATH once referred to the second crop of grass. AGATEWARDS, adv. To go agatewards with someone was to accompany him part of his way home, which was considered the last duty of hospitality towards a guest. An AGINATOUR was a hawker of small wares. This word occurs in Cockeram’s English Dictionairie, 1639. To AMUSE once had a very different meaning in some dialects, and referred to the action of flinging dust or snuff into the eyes of the person intended to be robbed. An ANATHEMATISM was a curse. Jenny Lloyd is the Welsh author of The Megan Jones trilogy; historical suspense novels set in early, 19th century, rural Wales. You can read about the books or purchase them by clicking on the links below.